1. Thunder were a five piece hard rock band from United Kingdom who formed in 1989, after singer Danny Bowes, guitarist Luke Morley and drummer Gary 'Harry' James left the band, Terraplane. They were joined by bassist Mark 'Snake' Luckhurst and guitarist Ben Matthews and put out their first album, Backstreet Symphony, in 1990. This year they also performed at the Monsters Of Rock festival for the first time. After their second album, Laughing on Judgement Day, Luckhurst left the band citing 'personal differences'. He was replaced by Swedish bass player, Mikael H?glund, and the band went on to record their third album, Behind Closed Doors, in 1995, which would be their last album on the EMI label. Mikael was unavailable for recording the band's fourth album, The Thrill of it All (1996), and so bass duty was left with Morley. For the tour, the band recruited bassist Chris Childs, who stayed with the band to record their fifth album, Giving the Game Away, released in 1999. In Autumn of that year, the band announced they were to split, annoyed at the state of the music scene, and following their final tour, they left in May 2000. 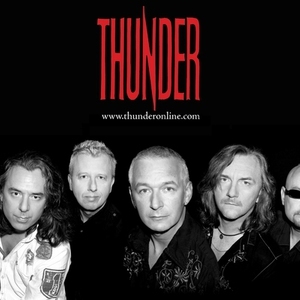 After being given a slot in the 2002 Monsters of Rock show, Thunder decided to return in 2003 with a new album, Shooting at the Sun, released on their own record label. In 2005, they released their seventh album, The Magnificent Seventh. After two well received tours in 2006, with many gigs completely selling out, and two gigs in Japan, which were eventually released on the DVD "Thunder Go Mad In Japan"
November 2006 Saw Thunder releasing their 8th Studio album Robert Johnson's Tombstone Which has received acclaim from fans and critics alike, many claiming that it was their best album yet. A UK tour took place at the end of November, with the annual Christmas Show at Nottingham's Rock City in December. Thunder released new material in 2007/08 by way of 3 EP's. On 3rd November 2008 a new studio album - Bang! - was released. This turned out to be the band's final album. The band appeared with Def Leppard and Whitesnake at 3 dates in July 2008. In early 2009 Thunder announced they were to split for the second time with final tours and festival appearances through the summer. Luke Morley went on to form The Union with Peter Shoulder of Winterville, who had been a frequent guest at the band's Xmas shows. Thunder reunited for the High Voltage festival in Victoria Park in 2011. After two warm up shows, in Sun Valley as part of the Childline Rocks Harley Bike Ride, and supporting Skin at Nottingham's Rock City, they took to the stage on Sunday 24th July. Although no full reunion, Thunder are planning Christmas shows for each year. The 2011 show was in the usual Nottingham Rock City venue, but they are intending to have Christmas shows around the country in future years. The 2012 show is scheduled to be in Manchester on December 21st and 22nd, at the O2 Academy. 2. German heavy metal band from 1981.